Solar Power has made great inroads onto Perth Residential roof tops over recent years. Savvy consumers are looking at ways to be more Energy Independent. A recent trend has seen a many Perth Homes disconnect their gas supply and install induction cook tops and heat pumps. This article looks at why heat pumps work so well with solar PV. heat pumps have a minimal and controlled known amount of power draw. These units can easily be timed during peak solar generating hours. heat pumps take up zero roof space. This leaves more roof real estate for solar power. under the current WA Feed-in Tariff there is no encouragement to sell your renewable power i.e. you are best using it! This graph below shows typical electricity generation for from a PV array (yellow) over the course of a year. The minimal power consumption from a heat pump (blue) can easily be covered by PV ensuring it's free all year round. And still leaves plenty of excess energy from PV generation for other power appliances around the house. Where as a traditional solar hot water system (green) needs an energy hungry booster that can consume more power than a PV could actually generate. But traditional solar hot water is Free From the Sun? yes it's free in Summer, Autumn and Spring. But when traditional solar hot water needs boosting in winter there is a large power draw, 3-4 times that of heat pumps. This is also when the solar power is working less effective and thus the energy hungry booster will draw from the grid. 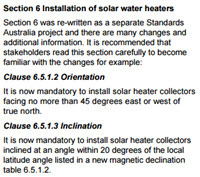 under the new Plumbing Code of Australia (adopted by the WA Plumbing Licence Board May 2016) solar hot water is restricted to being installed within the range of North +/- 45⁰. The result is prime North roof needs to be used for solar hot water......less space for Solar PV. Why don't you install an electric hot water system with solar power? Installing a large electric storage system on a timer is ill effective as this would generally consume more power than the solar PV system can generate. You would in effect have just bought an expensive solar power system for one purpose.....to heat your hot water.